The ramblings of a pilgrim through time, space, and life. Top (l-r): John Reese, Ray Charlton, Earl Hipwell, Miriam Weatherston, Delmar White, Owen Wayment, Neta England. Second: Orlo Maw, Warren Williams, Jean Etherington, Junior Taylor, Eugene Maw, Cleone Carver, Howard Hunt. Third: Ellis Lund, Vera Wayment, Keith Hodson, Ted Christensen, Ruth Wade, Wayne Taylor, Milo Ross. Bottom: LauRene Thompson, Frank Poulsen, Margaret Freestone, Ezma Musgrave. This is the fourth of the class photos. I believe this is actually the 1936-1937 year (Grandpa says in his writing it his his 10th Grade year). This class attended Weber High School located in Ogden, Weber, Utah. 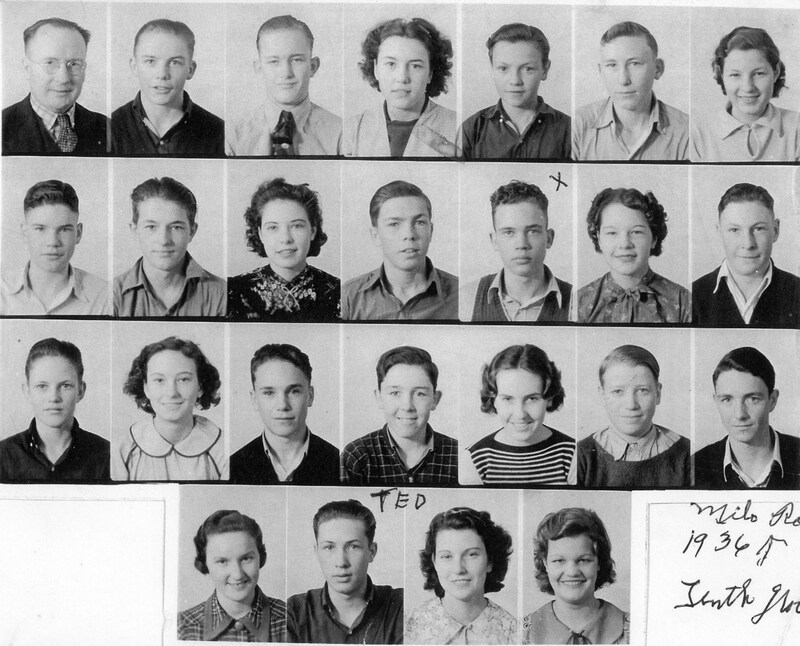 These students graduated in 1939. Nearly all these students came from Warren, Plain City, West Weber, and those parts of the county for school. Out of the whole picture, only one passed away in World War II (as far as I can tell, ALL the men served). Back (l-r): Cleone Carver, Vera Wayment, Margaret Freestone, Emza Musgrave, Jean Etherington, LauRene Thompson. Third: June Wayment, Miriam Weatherston, Ellis Lund, Ray Charlton, Ivan Hodson, Warren Williams, Ruth Wade, Tamara East, John Reese. Second: Lyle Thompson, Milo Ross, Eugene Maw, Earl Hipwell, Bill Hill, Keith Hodson. Front: Ted Christensen, Wayne Rose, Howard Hunt, Orlo Maw, Owen Wayment, Ellis Stewart, Delmar White. Since I am on a kick of pictures from my Grandpa’s collection, here is the third of the four. 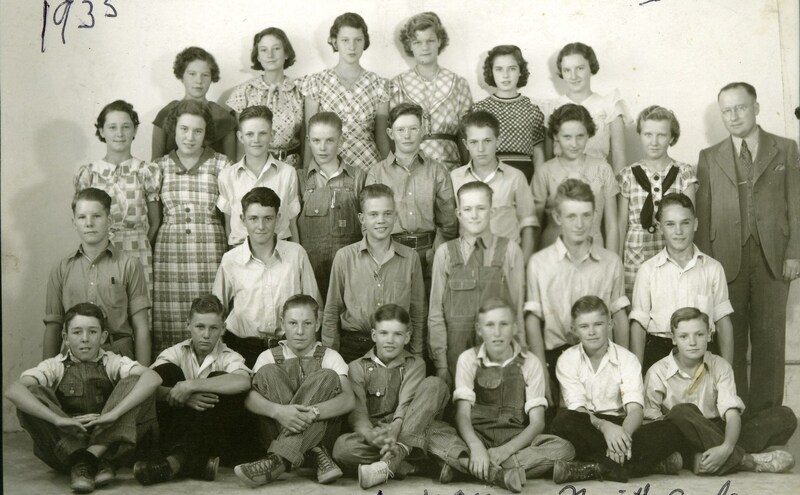 This is the 9th Grade class my Grandpa was in. Mr. John Reece would be this class’s teacher the next year too. I am pretty sure the 9th Grade was at Weber High School, but I have been unable to confirm what year switched between Plain City School and Weber High School in Ogden. Several of these boys died in World War II. The ones with question marks are likely still alive. I received an e-mail from Sally Buttars with some information about Grandma’s (Colleen Andra Jonas) Journal. Here are the details she helped with (with minor editing).